In 1985, I went with my mom to our vet's office in Indiana. We were there for regular shots for some of my mom's kitties. We always have had numerous cats and I had recently adopted a tiny little striped grey girl, naming her "Crystal". 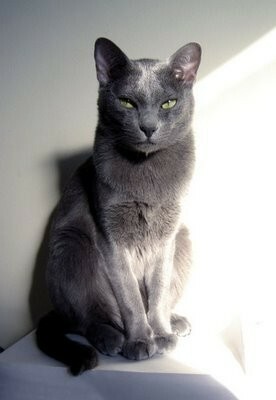 But while I was waiting, I looked up and at the top of a tall bookcase was a regal and strikingly beautiful full grey Korat cat. He sat tall and surveyed his room. I was told that he was a bit over a year old and had been abandoned, so was their "shop kitty". I was smitten. I asked if I could see him, but they said he never really comes down from his perch. I sat back down, but continued to look up at him and smile. After about 10 minutes, he stood up, stretched lazily, jumped down the stepped pathway and walked straight over to me. The office assistant was stunned! I picked him up and he sat right down in my lap. I guess I had passed his test and was his now. We took him home with the others, and in homage to a fantastic movie, I named him "Buckaroo Banzai". Mostly because I liked saying "It's Buckaroo Banzai! The latest issue!!" He didn't especially appreciate the antics of little Crystal, to which I'd have to remind him "Don't you hurt that kitten..." but he never did. He let her climb all over him and he'd grumble and threaten her, but when he thought I wasn't looking, I would see him wiggle his tail for her, or give her a hug and lick her ears. When I moved from my mom's, they both went with me. And then across the country to Oregon. When I began doing my artwork full time, I would play CDs and sing along while I worked. One afternoon, I put on a new Art Garfunkle disc. Partway through, the song I Only Have Eyes for You came on. I was upstairs in the loft and heard Buckaroo Banzai jump down from his chair, run up the stairs and he jogged right over to me, very insistent. I picked him up and continued to sing along and he started purring and drooling, wrapped his arms around my neck and buried his head under my chin. I wrapped my arms around him and started swaying with him while I sang. He was so happy. I had never seen him have this type of reaction to anything. When the song ended, he released himself and curled up on my lap while I continued working and singing other songs that came up on the disc changer. I figured he just needed some hugs and didn't think about it anymore, until a few weeks later when that song came up on the disc changer again. He did the exact same thing! He came from a different part of the house and insisted that I pick him up and hold him. Not to any other song by other artists or Garfunkle, just THAT song, by any artist. It became "Our Song". It was so predictable and exceptional that I could show my then-husband and guests what he did. It was beautiful and I loved that Banzai would dance with me to our song. Years later, I left Oregon with my kitties and could show my new partner about Banzai's favorite song. When Banzai was about 14 or so, he started going deaf, so didn't hear when the song would come on. I would stop whatever I was doing, go and get him and hold him so he could feel my throat vibrate to his favorite song. We'd have our dance while I sang to him. He would wrap his arms tight around my neck and burrow his head under my chin up against my throat. It was clear he knew. At the end of his life, as he passed away from me, I held him close and sang his favorite song to him with his head up against my throat so he could hear me. He purred and then passed away. That was in 2000, and still every time I hear his song, I stop, close my eyes and feel his arms around my neck, his head under my chin, his purr. I miss you tremendously, Buckaroo Banzai. I'll play our song.